There is a moment in Redtwist’s Shining City where, lurking behind a door, a split-second spark of divinity is revealed. It is bloodied, silent, and is at once horrifying and reassuring. To call Conor McPherson’s play a “ghost story” would imply it provides some answer to the nature and existence of another world or its inhabitants. But in the streets and isolated dwellings of McPherson’s Dublin, there is no such certainty. Even when an apparition is in plain sight, its significance, meaning and reality is just painfully out of reach. This play is rather, for all its melancholy and despair, a love story. 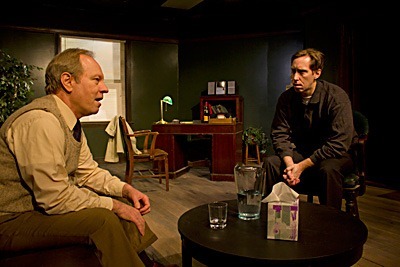 Set in an upstairs therapist’s office, Shining City chronicles the sessions of middle-aged widower John (the superb Brian Parry), and his ex-priest doctor, Ian (John Arthur Lewis). 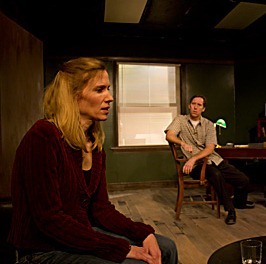 After the sudden death of his wife, John has begun to see visions of his spouse, moving him out of his home and into a local inn. Ian, wrestling with his own losses, has just left the woman he abandoned the Church for. The mother of Ian’s child, Neasa (Cheryl Lynn Golemo) struggles to exist separated in the unwelcoming company of Ian’s family. Two months flash between each scene, and as time goes on, the three slip further away from any assurance of who they are or the morality of the decisions they’ve made. Each of these characters are, in one way or another, in limbo. They are all lost between homes, identities, loves, or sexualities, and seek escape in all the wrong ways. 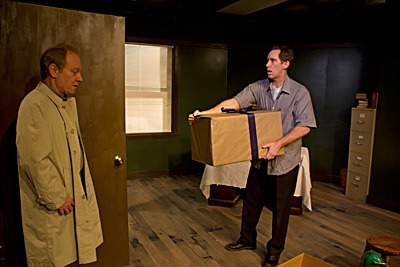 Director Joanie Schultz comments in her program note that she calls upon her own experience living out of a suitcase to relate an ambience of no refuge, which she accomplishes brilliantly in this production. Redtwist’s nearly claustrophobic performance space serves to amplify the overtones of each character’s underlying fear and wanting. 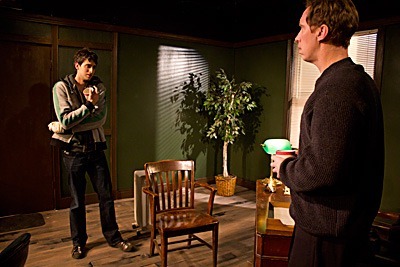 Much of the action is relayed through long, patient storytelling, and just as John cannot escape his guilt and anxiety, we as the audience are seated almost in the hyper-realistic office right there with him, his deep-gravel, hypnotic voice only feet away. These characters are richly drawn, and this ensemble does great justice to them, supplying flaws and sympathies to their humanity. In the intimate setting, no detail goes unnoticed, and play’s production team has created a scrupulously complete environment, from the window’s view of a cathedral to the ideal selection of transitional music. McPherson doesn’t appear to relish the hell he puts his characters through, making their struggle all the more real and painful to watch. It also makes their redemption that much more believable and satisfying. Shining City’s finale may prove to be divisive for some audiences. I encourage them to take note of John’s declared realization when considering the play’s last image: it isn’t the fact of what happens that’s important, but instead the effect. Regardless of their conclusion, the effect–like this production–will be moving. Production continues through February 27th – Thu, Fri, Sat at 7:30pm and Sun at 3pm. No performance on Sun, Feb 6, but an add’l perf on Sat, Feb 26, 3pm. The show’s running time is approximately 1:40 with no intermission. Tickets: Thursdays, $25; Fridays & Sundays, $27; Saturdays, $30 (seniors & students $5 off). More info: www.redtwist.org/Tickets.html. The League of Chicago Theatre’s “Theater Thursdays” is really a great program, and is worth checking out. Every Thursday the League offers specially-priced tickets to one of Chicago’s popular plays, along with cocktails and appetizers before or after the show, PLUS the chance to hang out with the artists and/or take a tour of backstage, etc. In a Dublin psychiatrist’s office, a distraught man reveals a fantastical happening: the recent sighting of the ghost of his newly deceased wife. Thus begins this haunting, mysterious tale about two people’s searches for love, meaning and their places in the world. For more information on how to get tickets (tickets go fast!) and make reservations, you’ll need to go to the League of Chicago Theatre’s website: www.chicagoplays.com While at their website, you might want to sign up for ChicagoplaysExtra, and receive periodic emails with information on shows, events and special offers tailored to your interests.